Race Reports | Move fast. Think slow. Ever since I’ve been an Xterra racer, I’ve always been envious of the fast swimmers. They are up at the front on the race, in control, and know what’s going on and likely what position they are in. 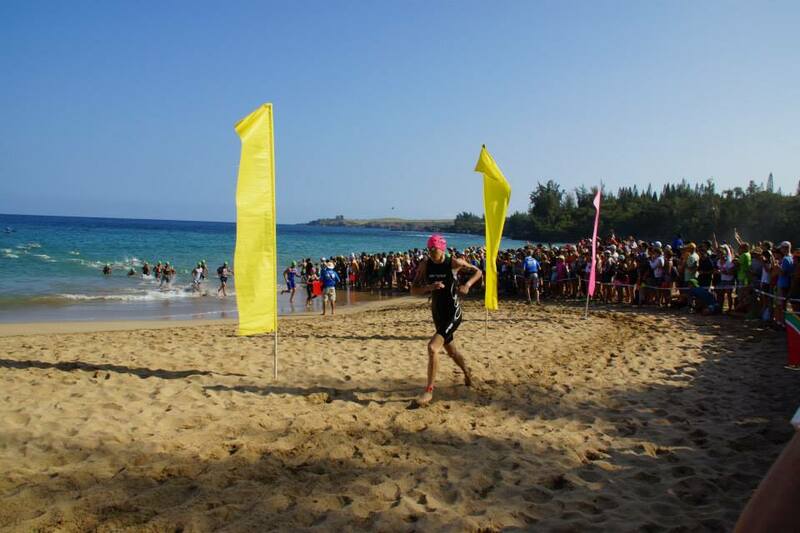 Fast swimmers get to head out onto the single track first without any traffic and simply have to charge forward on the wide open trail to hold off as many people as they can for the rest of the race. Racing from the front or chasing from behind? Which is more motivating? I suppose it depends on how you rise to the occasion of whichever race scenario you find yourself in…. 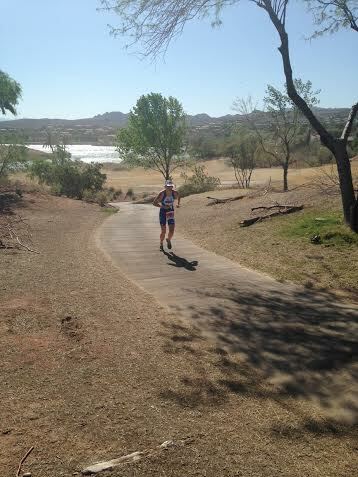 Unfortunately for me my first two Xterra races of the season have been long, solo efforts of chasing from behind. 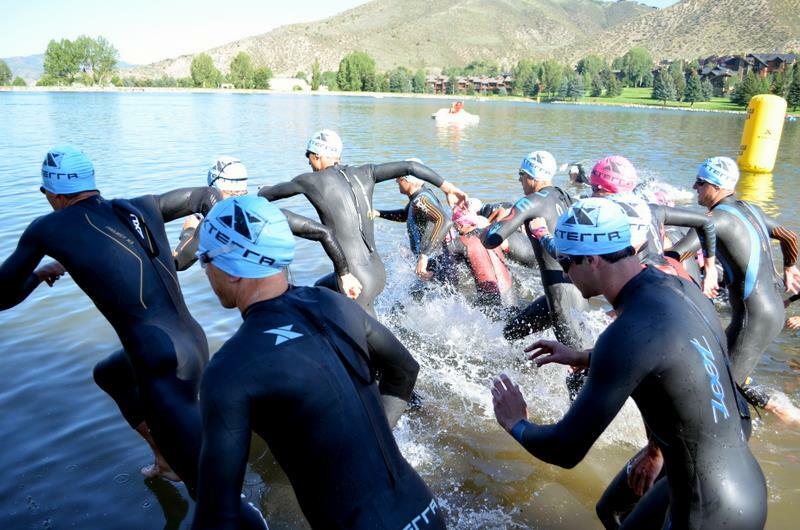 While I’ve certainly tried my best to hang on, the ever-increasing swim speeds of the majority of the pack in Xterra are tough. Its my own fault when I lose the front pack and the challenge of catching back up begins. In the last race in Alabama on May 17th I chased all day and gave it my best effort with the 2nd fastest run split but unfortunately didn’t close any gaps so 6th again it was. It was an eventful race with colder than ever temps (14 degrees C!!) in the usually hot and humid south, along with a massive, dark rain storm that left my hands and feet numb and I bounced down blood rock on my bike and tried to get the circulation going again. After one really hard crash on my right knee, which I still can’t kneel on without pain, it was still overall a fun day. But I was missing the real racing battles that I love. 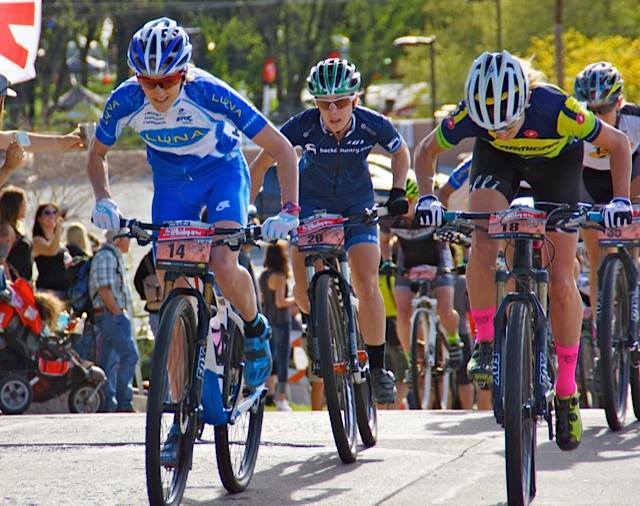 A few weeks before the Xterra SouthEast Champs I flew down to Prescott, AZ for the last weekend of April to have a go at the Whiskey 50 mountain bike race. (thanks to my brother for lending me some Aeroplan points for my birthday weekend, and for my Luna teammate Katerina for letting me crash in her hotel room). The event started out with a road criterium on the Friday night. After not racing a crit or a short track race in at least 5 years, and on the verge of turning 39 I was a little nervous about whether I have any fast twitch left in my legs. Feeling extra sluggish with a small head cold, I chugged a few shots of espresso before the race and hoped for the best. When I heard “first lap prime” on the start line, with all systems firing with caffeine, I just went for it up the first hill. Unfortunately after the descent I only came across the first lap line in 3rd, and then realized I had to go up the hill about 9 more times – ouch! I regrouped enough to hang it for 8th but it was a lung and leg busting, post-race cough attack inducing race! Leading out the crit at Whiskey 50 with a “well this isn’t too bad smile” before the pain hit the next lap. The Sunday 50-mile mountain bike race was great too, after snow (incredible freak weather) the day before for the poor amateurs, the single track was in mint condition for the Pro races. After hanging with Erica Tingey and Rebecca Dussault in the mom-pack for a bit, it was time to work up the massive long climb. I bridged up to 3-4 girls on the climb and went kamikaze on the last long descent before hitting the road home and pinning it as fast as I could with Heidi Rentz hot on my heels after the last single track to roll in for 9th place. A week after Alabama, I enjoyed the luxury of a local race, the Oak Bay Half Marathon. Being Victoria, the land of many fast runners, I was hoping for some good company. Unfortunately once the race was underway, Marilyn Arsenault was off the front and my good training buddy, Clare was behind me, and so it stayed for the rest of the race, I was stuck in no (wo)man’s land with no guys either! But a fun test to keep charging and on a slightly hilly but scenic ocean side course I finished the day a few minutes off my best in 1:21:23 for 2nd female, and 5th overall – and then couldn’t walk for a few days. And most recently was the Island Cup mountain bike finals in Campbell River, B.C., 45 minutes north of my hometown of Courtenay. 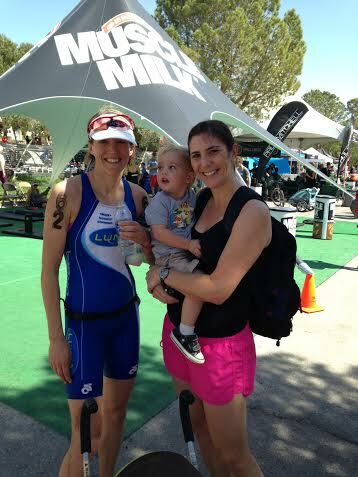 When I saw super fast mom of two, Carey Mark, on the line I knew it would be tough day. I got to the first single track in front of her but by the end of 1 lap she was still on my tail. She went by and I was looking forward to following her for a bit but unfortunately she took a slight wrong turn and I was back in front. That’s where I stayed, putting as much power in to my pedals as I could to break away and trying to stay smooth over the rocky, baby head descents on my hard tail, rough stuff! And after approximately 1h45 of racing Carey sling shotted around me for the win! The last time we raced I beat her by 1 second! Now that was a race! Chatting randomly after the race about cyclocross, Carey said, “You should do it, you’d be good with your aggressiveness.” Me? Aggressive? I had to chuckle. But it made me think, I have always raced my best, running on the track, short track, mountain bike, and triathlon, when in a head to head, even body contacting battle! And maybe that is why I will likely never do an Ironman. After dabbling in some 70.3’s the last few years, I returned my Tri bike this year. While some thrive on it, long solo efforts are not fun racing for me. 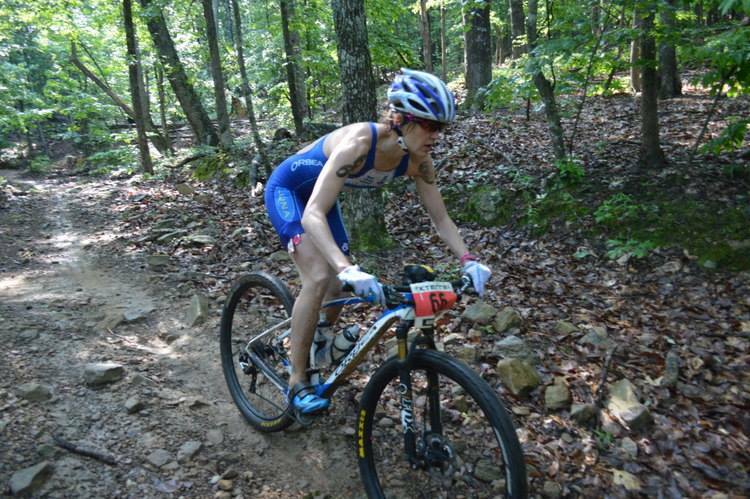 As I head to Richmond, VA for the next Xterra next weekend I hope for the luck of a good battle, another female Pro or otherwise! Either way, it is the race with some of the best mountain bike trails in the series so it will be fun regardless! Bottom line: No matter how big or small, A-race or not, if you find yourself in a great race within a race, seize the opportunity to bring out your best! And if you like those long solo efforts, all the better too – maybe something like an Ironman or Ultrarunning etc is your thing – knowing your racing personality helps a bit too! 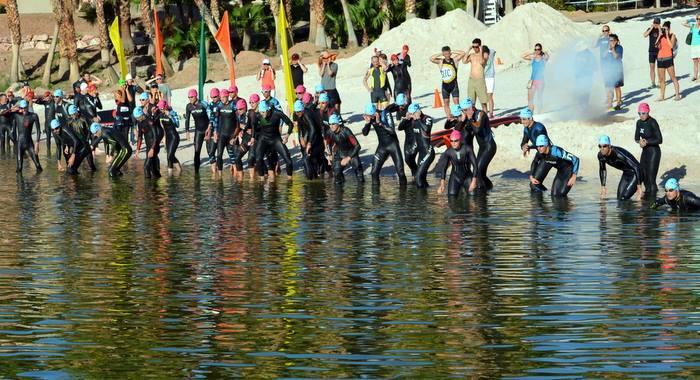 The first race of the U.S. Xterra Pro series kicked off this past Sunday at Lake Las Vegas Resort about 30 minutes south of Las Vegas. As you can see the unique landscape is nothing like what I’ve been riding all winter at home in Victoria! Out on the bike my goal was to hold off and then hold on to my teammate Shonny as she was creeping up on me on. Unfortunately that plan derailed pretty fast as my seat bag felt off and was bumping along my tire. I quickly tied it back on before it promptly fell off a second time, a real momentum killer! At that point I ripped it off and shoved in down my chest where it stayed for the rest of the race as you can see in the photo below. It actually didn’t bother me at all – a future way to carry tools, CO2 and tubes?? I do love my new tri-suit from Champion System for sure, especially when it can help hold the essentials over so many bumps, ha! Gel on leg, seat bag down front, fun riding! Onto the run I had big ground to make up. I was feeling pretty good until about the point this photo below was taken, maybe a mile into the six miles. 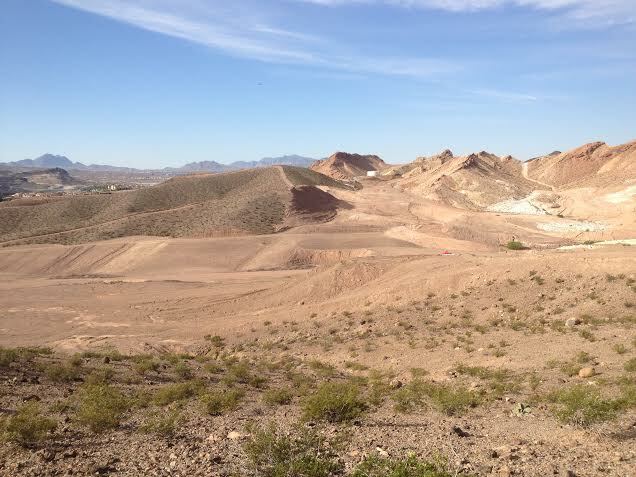 Once out on the moonscape again, my tank was feeling pretty empty, reminiscent of my first year of Xterra racing before I had figured out the training and racing of triathlon.The run followed the first 4-miles of the bike course again and the wind was really whipping up. It was sort of fun passing the many amateurs riding (who had started racing 30 min after us) but not so fun trying to stay out of their way and out of the rocks on the descents. Quite sketchy really. Especially as my friend Mike nearly clipped me while making a pass – the guy he was passing had blocked his view of me and he didn’t even see me until going by – yikes! Anyway, I ran on but wasn’t feeling too frisky. I could see Chantell up ahead at some points but I was still over a minute from catching her when I crossed the finish for 6th. Flora Duffy killed it for first with a huge margin win, but about 3 minutes separated 2-6th place. 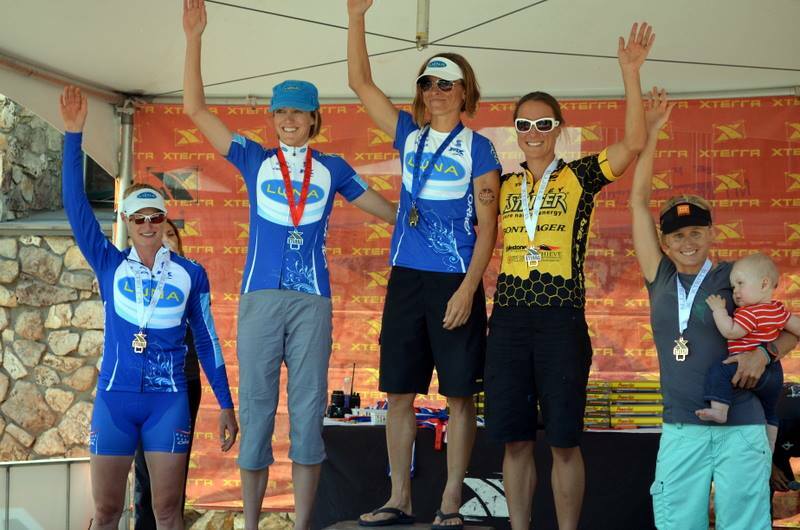 (Emma Garrard was second, Luna teammates Shonny and Suzie took 3rd and 4th and Chantell Widney from Edmonton took 5th). A post-race analysis with my coach revealed that after loosing a gel (down my leg) and by miscalculating my drink mix I only put in about half the calories I should have for the race! 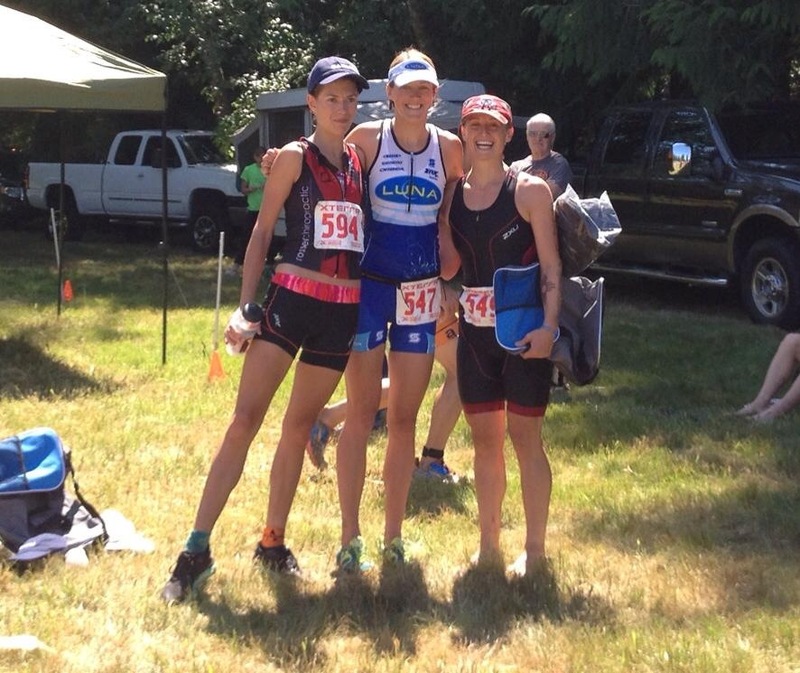 Rookie mistake – how long have I been racing?? Seriously! Looking forward to tackling the next Xterra in Alabama in about a month and seeing what if a little more sugar in the system will add to the late race fun factor! Of course one of the biggest highlights of the weekend was catching up with my University of Washington track running teammate BFF, Amy after not seeing her for three whole years. She drove up from San Diego with her youngest son, Charlie (21 months) for Sat night and thanks to her for taking some of these pics and cheering us all on! Next up for me is the Whiskey-50 mountain bike race in Prescott, AZ in two weeks. Should be a good time! Thanks for reading and Happy Easter weekend!! This means a 4-day long weekend up here in Canada, yahoooo! Bring on the chocolate egg hunting! Why Running will always Rock! I finished my second race of 2014 today, another road running race. It was 5 km short 😉 The last time I raced a 5 km was at the end of my racing days on the track, the last race of my senior year running as a Husky for the University of Washington. I was 1:12 slower today then back then, and although my legs wanted to party like it was 1998, my body that has since morphed into a cyclist and now a triathlete knew I would be well off the pace of my much younger self. 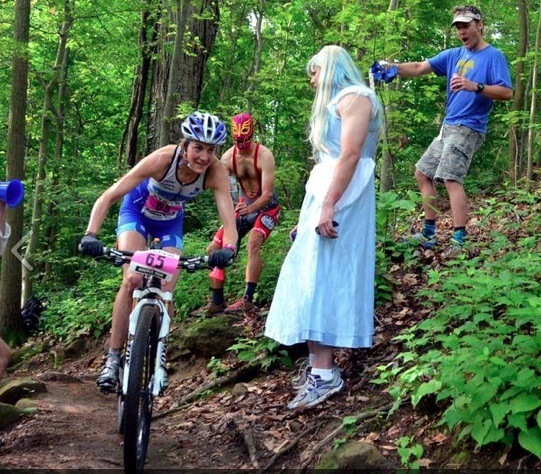 In a running race there isn’t always much of a story to tell, unlike the endless war stories of mountain bike and Xterra race days. Today, a few elbows were thrown around off the start line as myself and 632 other runners headed off for the out and back race along the gorgeous seaside in Sidney, just outside of Victoria. Like most, I went out a little fast, then settled in, found my rhythm, and felt like I was rolling better on the way home. I picked off some people and had a little kick to come home across the finish line. 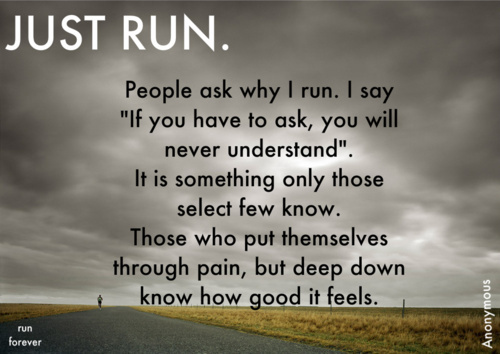 Of course it hurt, like most running races in which you decide to push yourself. 1. Time. Like my race today, running definitely takes less time out of your day. And probably gives you the most bang for your buck for building overall fitness. 3. Anytime. Anywhere. Any season. Running can be done anywhere. Road. Trails. In a city. It is also the perfect pace to enjoy the scenery and take it all in. It can be done in most any weather or season, and doesn’t require any special facilities. 4. Social. Many of my best friends and more memorable conversations were through running together. There aren’t many sports where you can train side by side for long, and enjoy long conversations. One of my favourite memories growing up were family oriented breakfast runs with our local club. 5. No equipment advantage or maintenance. Unlike the sometimes snooty world of triathlon, no one stands around geeking out over what running shoes someone is wearing before the start of a race, or how much they must be worth, gasp! A good pair of running shoes is affordable to most anyone and a plus but they will never win you the race, you and your body alone must do all the work! You also don’t need to use your precious time maintaining, updating, or cleaning your running “equipment”. Just stick your stinky shoes back in the closet until tomorrow’s run. 6. Races en masse. Whether on the track, the road, or in the trails, running races always have plenty of participants. Big ones even have pace bunnies. There will be no shortage of people to run with and help push you to a personal best or simply keep you company. Because running is such an accessible sport, most can relate well or at least understand if you say, “I’m a runner”, unlike the more obscure sports. 7. Freedom. As related to point 3, you are free to run anywhere. Whether going to work for the day or travelling all you need to do is pack a pair of shoes and some running clothes to get a workout in while you’re away. 8. Life Balance. While this is certainly debatable, to reach your full potential as a runner it much easier to balance with other pursuits like school, family and/or working full-time. You don’t need to train hours per day or sacrifice another entire area of your life to give your running goals your best shot. 9. The Mom Factor. Of course I can’t forget that getting a run in was the easiest thing to do with me wee little ones (in the single and then double chariot carrier), and now I can run along with them while they ride their bikes. In a few more years I will be trying to keep up to them on our own family runs! Though the Xterra season is long, being from a Northern Nation, I usually feel like I get into my best shape every year near the end of the season after lots of outdoor riding etc all summer. 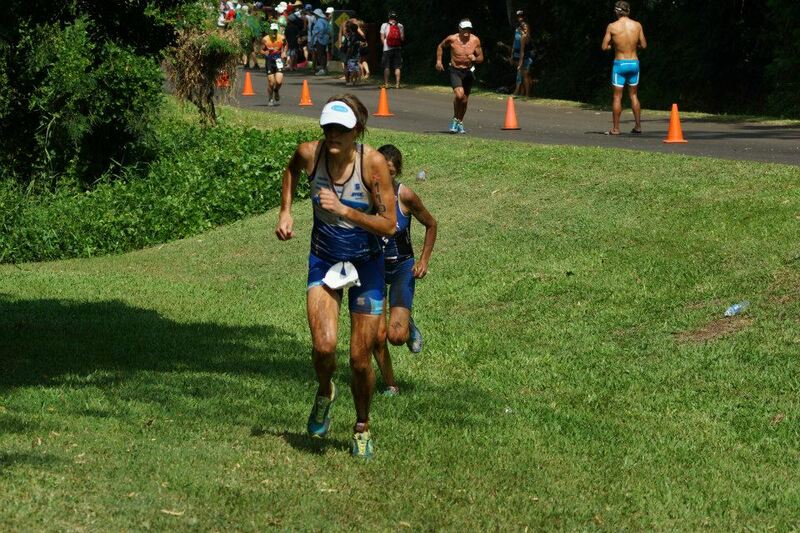 As per usual, Xterra Nationals went fairly well and I was continuing to build that fitness a little in the 5 weeks up to Worlds. Having moved the family out to Victoria, B.C. (back to my homeland :)) on Labour Day Weekend, I’ve also thoroughly been enjoying the new training grounds! I’m now looking forward to a snow free winter, apart from weekend excursions up to Mt Washington for our ski fixes!. I was counting my lucky stars after having avoided the two rounds of colds my kids have gone through since school started. The day before I flew to Maui, I had a light head cold and was feeling tired but still had good energy in training. Wednesday was travel day and with a gong show of flight cancellations/changes and late arrival, sleep was less than ideal. Thursday I felt like crap and rode an hour on the course. I was a big grumpy pants but from past experience I knew I always feel terrible my first day in Maui with the jet lag and the heat. So it was hard to tell the difference between being ill and adjusting to hot Maui. With congestion and a scratchy throat I wasn’t sleeping well but thought maybe I had a real cold beat by Friday morning when I headed out for early run. But by that evening my sore throat was back in full force and by Saturday morning my cold was in my ears and voice. Fun times! I enjoyed a little swim practice that day and just tried to rest. It was World Champs and there was nothing to do but race!! Heck, nothing to recover for afterwards! Except maybe the post-race party…. I was more than happy that race morning started with relatively calm waters. After being full on “scorpioned” by the waves crashing at last year’s swim exit, the few 2 footer waves at this year’s start were nothing! I was excited to get going. The canon went off and into the washing machine I dove with the rest of the Pros in our 2 minute head start over the other 700 or so amateur men (wave start 2) and amateur women (wave start 3). I had some feet until close to the first buoy (500m out) but was sort of alone for the rest of the swim until many of the green capped age group men were going by me. 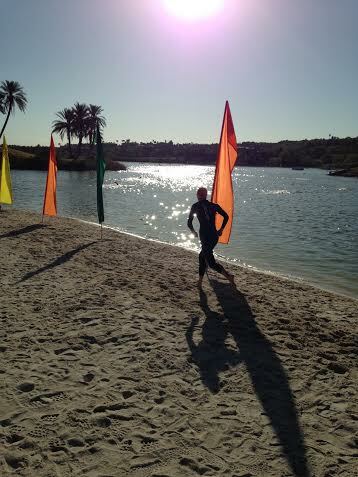 I came out of the water unscathed, phew! Onto the bike, the first 3 miles was likely the hardest part. Unlike last year, this time we rode the first 3 miles of the run course, which meant a lot of steep, sandy ups in the full sun. The bike course was rumoured to be almost two miles longer than last year so I knew pacing would be key. My teammate Shonny passed me in the first few miles and I tried to hang with her but failed. She went on to ride the fastest bike split of the day and finish 8th overall. I focused on racing within myself – whatever that meant for the day – and found myself around a lot of the same guys for the rest of the race. When I wasn’t shooting out snot rockets (sorry, gross), or coughing now and then, over the two hours on the bike I made a few catches and actually quite enjoyed the somewhat twisty sections of the last few miles of the course and was making bigger ground on peeps there. The very top of the course! At the start of the run, Melanie, Carina, Kathrin Mueller of Germany, were all within site. So was our amazing young (17 years old) Luna teammate, Hanna Rae Finchamp, who went on to win the overall amateur title. It was a sufferfest as always, but I felt I had at least got the hydration part right for the run. Apparently with the trade winds dying down for a few days it was hotter than usual. Although sick, I actually felt like I still had a little more spark in my legs than I did after last year’s severe leg cramping incident coming out of the swim. But not feeling 100% definitely put me out of contention for my goal of the day – a top 10 after last year’s disappointment. In the end, I managed 16th in one of the toughest Pro fields ever. Every year, the competition gets stronger. We had a new women’s winner this year – Nicky Samuels of New Zealand, who won handily by 2.5 minutes over Lesley Paterson (2010 & 2011 World Champ). Lesley out sprinted Flora Duffy of Bermuda for 2nd. Barbara Riveros (runner-up last year) was fourth. 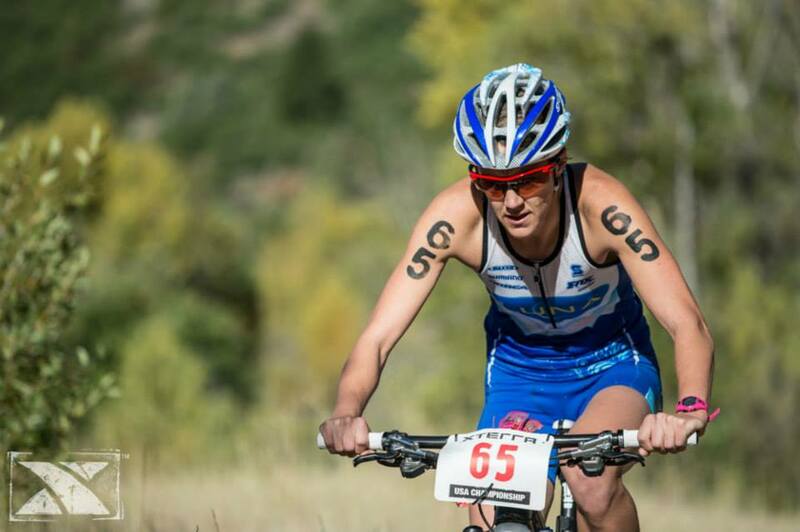 AND….drum roll….Emma Garrard rounded out the podium in 5th to win the Pro Mom category :), on her first season back with a 10-month old son! Full results can be found here. 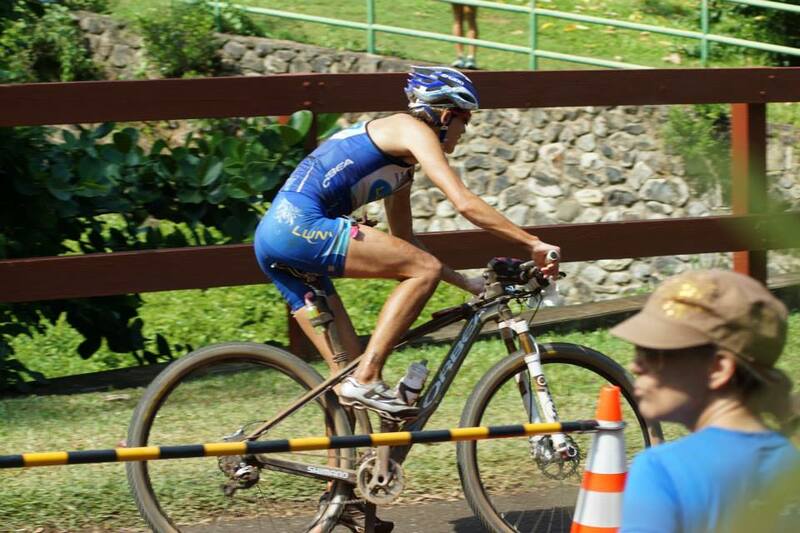 Maybe one day Xterra will consider doing some proper trail building in Maui or even moving the Worlds venue around like many of us have suggested. If not, it is still the toughest race of the year, for length, climbing, and conditions – heat and surf – but not for technical riding – a triathlon that was originally meant for mountain bikers….hmmmm. As always, a HUGE thanks to Luna Pro team manager (Waldek, also doubling as team photographer) and team mechanic (Chris), for all the amazing race support. Thanks to Chris V. and Brandi also for the amazing support during the race. Thanks to Katie, Debby, and Brandi for being such awesome housemates at Napili Point. I think my ribs and abs were more sore from laughing than from race exertion and coughing! Now time to get healthy enjoy the official off-season! 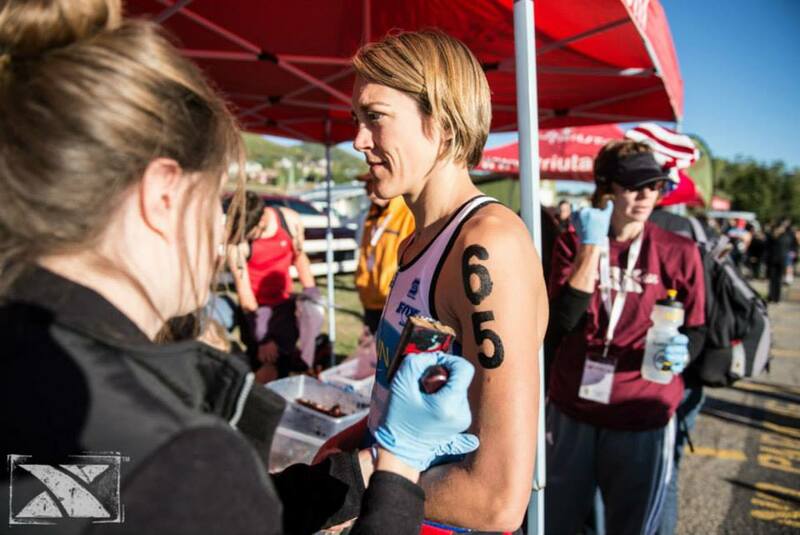 The Xterra USA Championship race is the 5th and final race in the Pro Points series. In order to contend for the overall prize purse it is mandatory to do this race, and one race (your worst result) is dropped in the final tally. 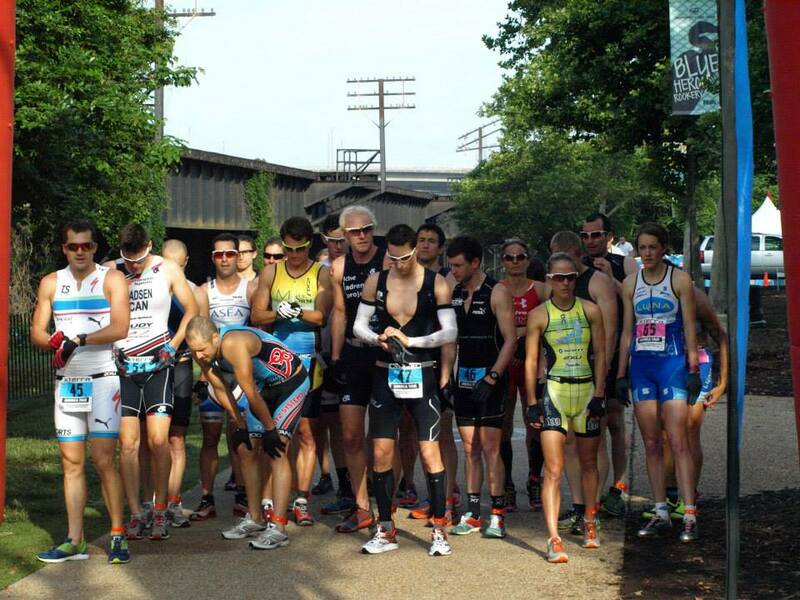 American amateurs from all around the country also need to qualify for the race in their respective age categories. However, the Pro category lets us International folks in the race. Like every other year I’ve been in Odgen, Utah, during the third weekend in September, the sun was shining and the reddening fall leaves were beautiful. As painful as riding uphill at altitude can be, the amazing colors and beauty of the trail always make me smile and grateful to be out there! 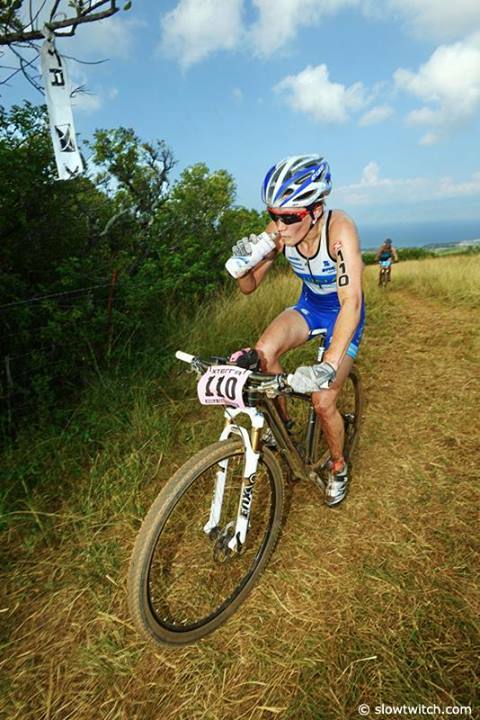 Now, I love my main sport of Xterra for the relaxed, chilled out and friendly atmosphere. However, unfortunately the relaxed nature of it all in regards to actual distances was a rather large disappointment when the race started out with the longest swim I have ever done in a triathlon, period! And I have done several half-ironman triathlons. The reservoir we swim in was unusually low this year so some of us thought, that is why the first buoy looks so far out there! We headed out into the glaring sun and boy did it feel like a LONG time before I rounded that first buoy. I had some good drafts for a while, and eventually the surging fast age groupers flew by after starting one minute behind us. And eventually I was settled into a pace with a few blue caps, and Heather Jackson just in front of me and Renata Bucher behind me and that was how we left transition as well 34 minutes later!!! To give perspective, for a 1500m swim I am usually in the 24-25 minute range. After the race, most estimated the swim to be around 500m too long! That aside, I wasn’t really aware of how long the swim really was until the end! Off an on to the bike, I was feeling pretty awesome. I ditched gloves for this race and likely gained some serious time on the long road stretch for this smart move! Up into Wheeler Canyon, in the shady, and rockier section I was making some good time and quickly overtook Heather Jackson. Not long after that I felt like I was kind of in no man’s land for a while. 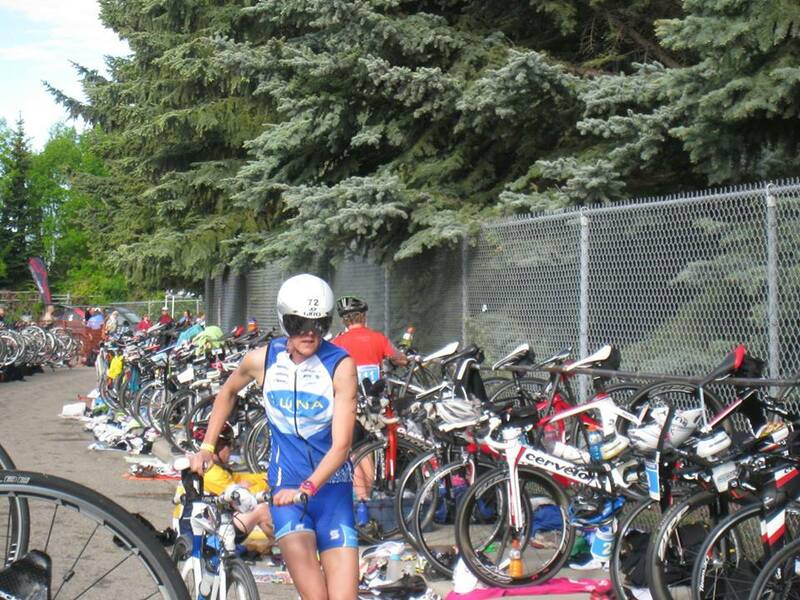 I was surprised more male age groupers weren’t passing me – perhaps the extra long swim left those stronger mountain bike types farther behind than usual! I loved the short-lived descending and once up the steeper switch back climbing to the summit of Sardine peak I came upon Jackie Slack and Christine Jeffries. 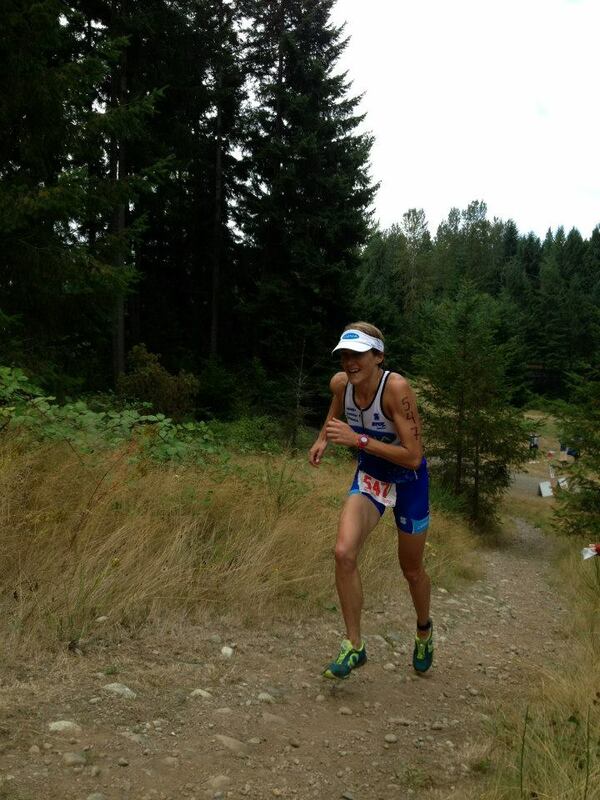 I had the last long descent all to myself with no one behind or in front and headed into and out of T2 in 8th place. Up the first and very steep climb up a ski hill I could see Carina Wasle of Austria just ahead but it would be a few miles before I actually caught her. I was feeling pretty good and before the end of the first, fun, up and down windy single track I came upon Suzie, and then Melanie once back out on the double track. And then I finally saw and caught Carina on one of last climbing sections. I had made it to 5th. But no slowing down yet! It was a lot of gravity running in the last mile plus to the finish and after missing 3rd by 13 seconds last year I wasn’t about to give up any free time this year! In the end I crossed the line well over a minute behind 4th (Emma Garrard) and was definitely proud of my effort. Although it was one of my lonelier races (e.g. without many people around me much – weird!) I felt like I was always pushing and “racing” my hardest, gave it my best so to speak. 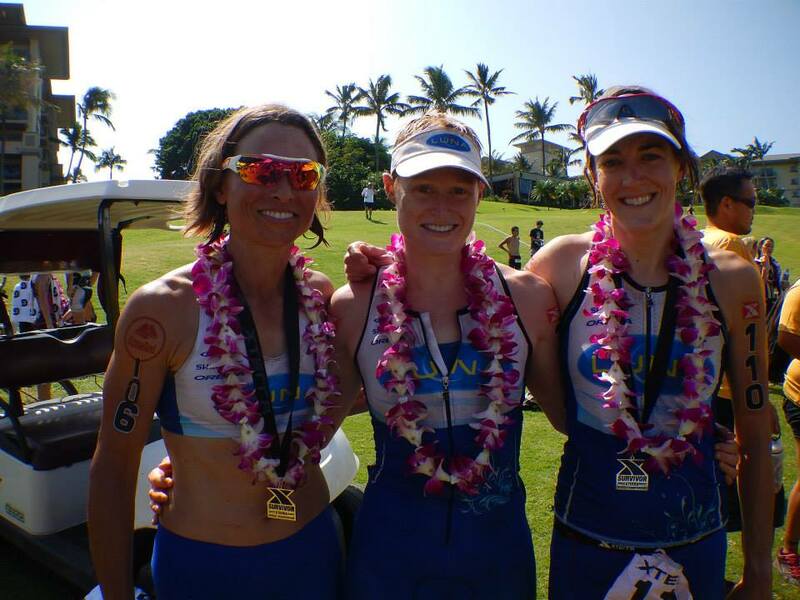 Out in the front Leslie took the win, Barbara was 2nd, and Chantell Widney (mom of 5-year daughter, up and coming Xterra superstar, watch for her in Maui!) was 3rd. 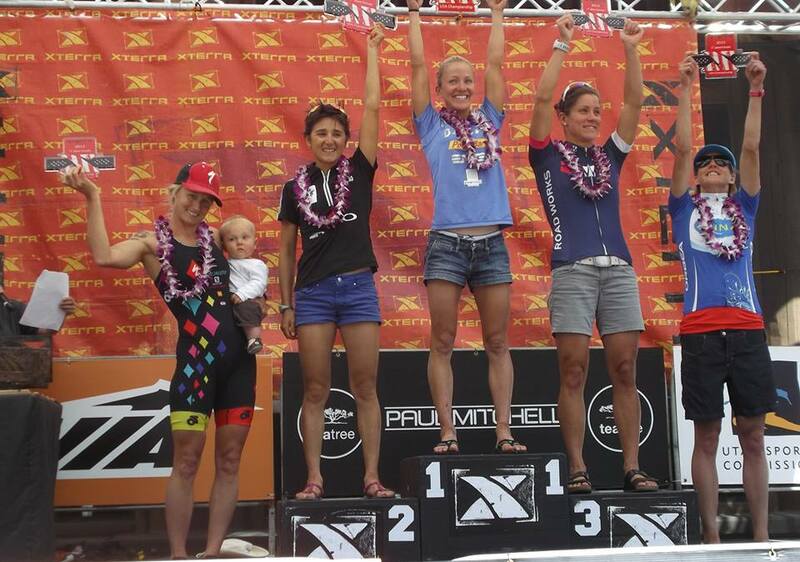 That equals three moms on the podium! At the end of the day, I had also jumped from 5th to 3rd overall in the Pro series – a nice surprise! After a slightly crazy couple of weeks prior to the race spend relocating our family to Victoria, B.C. from Calgary, AB and miraculously not getting sick as my kids came down with colds, I was happy to get through this training block and race healthy and fit. Even half of my housemates in Ogden were sick! And many thanks to the Kunz family for opening up their large “cabin” to Branden, Bri, Craig, Josiah, John, Steve, Brandi and I for several nights. It was a fun, relaxing place to hang out, and full of laughs right to the end, except when Branden almost died on the backyard zipline – but that’s another story! Canadian Chicks! In 3rd, 5th, 8th, 10th and 14th! Now its back to work before the big show off of some beach in the Pacific in exactly one month from today – Oct 27th. In the meantime, I will get back to adjusting to and enjoying life on my favourite island – Vancouver Island – and continuing our rather interesting, and way too time consuming house hunting! It was a super fun time. On Saturday, my homestay Carrie and I drove down to Black Diamond from Sammamish (pronounced sa-MAM-ish, not sa-MA-mish as I kept saying, ha!). 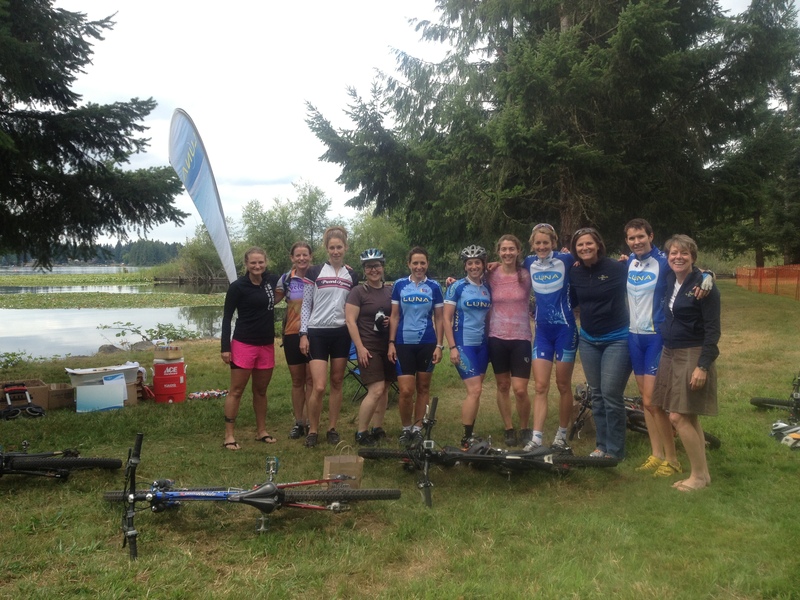 With 12 attendees, we talked the new-to-Xterra ladies through the specifics of swim-bike-running in off-road triathlons before going through a pre-ride of the two-lap 7.5 mile course. It was the most amount of single track over rocks and roots I’d ever seen, twisting like crazy through salal bushes, giant ferns and dark rain forests, quintessential Pacific Northwest style. It also involved almost zero vertical gain, not the best suited course for my strengths but a perfect one to practice my not so amazing cornering skills! 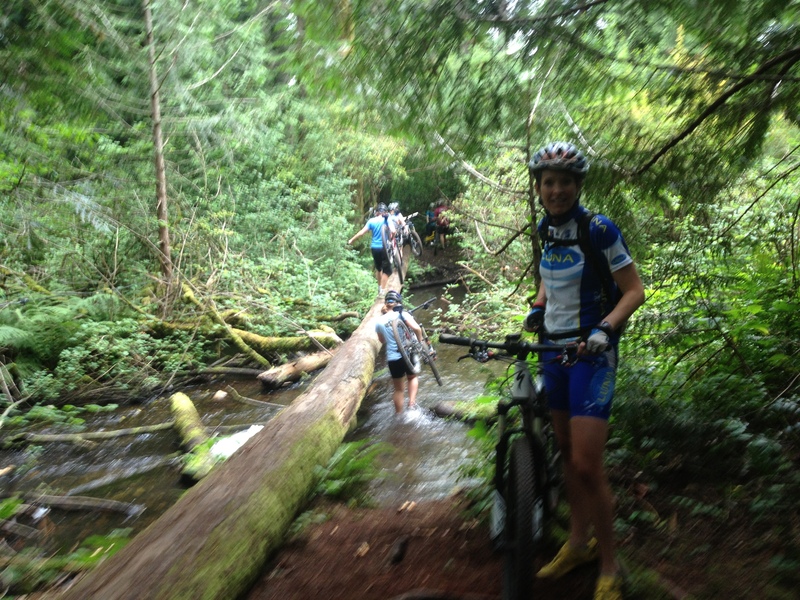 Everyone did great on the ride and we all made it across the sketchy slick log for the creek crossing that we had to run through twice on race day (pictured below). Out on the bike it was nice to not have too much traffic. It was a course that required full focus to try to remember what was around each blind corner! Near the end of the first lap I heard a female voice sneaking up on me and wasn’t too surprised that there could be some stellar local mountain biking talent in the race. Turns out it was Solana Kline of Bend and the girlfriend of Ryan Trebon, and therefore knows my brother Geoff quite well – small world!! 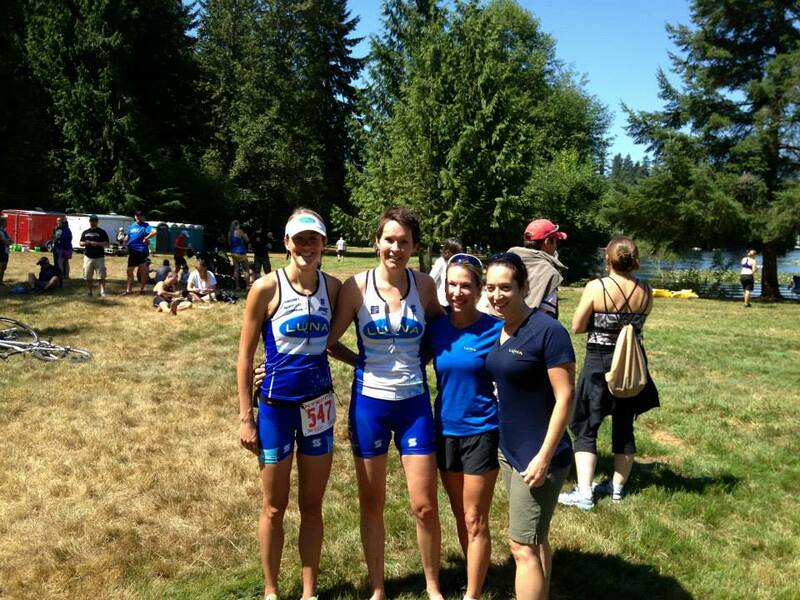 She had also just entered and won her first Xterra race at Vashon Island, WA! Solana was in and out of my sight for a while but on such a tight and dense course, it is hard to see anyone within 30 seconds but at least I was enjoying connecting the dots together better on the 2nd lap! As I headed into T2, I saw Solana running out so I had some work to do! The run was a 2-lap almost figure-8 course with a pass near the finish 4 times. It was much like the bike course, always keeping you on your toes to navigate turns, and leap over roots, rocks and logs – only maybe a mile of open double track to just plain run! 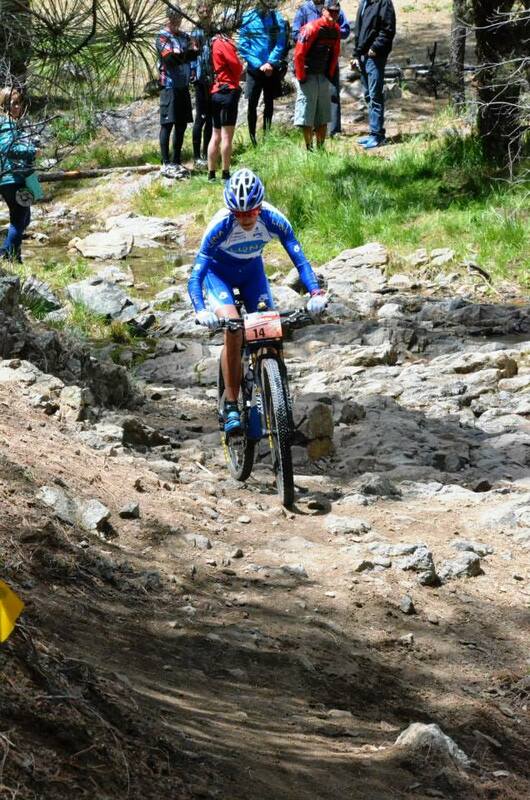 After 2h39min I crossed the finish for 1st in the women and 9th overall. 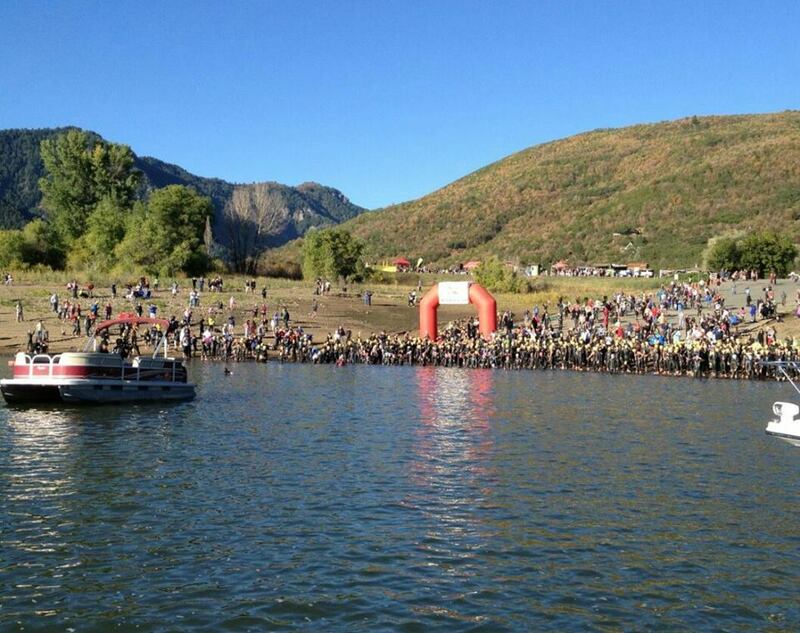 A great day, and it was fun meeting lots of new Xterra friends! Thanks to Carrie, Eric, Seamus and Sirus Atwood for the amazing having me stay for the weekend with amazing hospitality! Congrats to Carrie who had a rocking day on the course and set a personal best time – no small feat just over one year after having brain surgery! I love mountain venues. I think they remind me of my first years of mountain bike racing. A beautiful ski hill resort, lots of fresh mountain air, plenty of climbing usually rewarded by long, fun, technical descents (although the long descent factor was missing this weekend!). A very relaxed place to be for a race! Back in Beaver Creek, Colorado on Thursday for the Xterra Mountain Championship this past Saturday, I timed my only pre-ride of the course by finishing the last technical descent in the dumping rain. Not the best way to check the feel of the trails which were all dry and nearly dusty again by Saturday! After an ideal pre-race day of run-nap-swim-eat beets I was feeling ready and rested. I knew being next to Vail, CO that we were high and in thin air but I honestly couldn’t tell you the altitude before the race. I just know it pays to be a wee bit more conservative but otherwise my only plan was to listen to my body as usual – race hurt is race hurt! 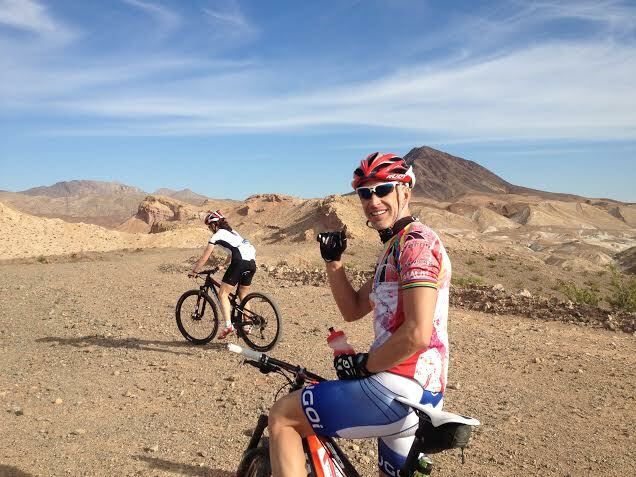 But for those interested the race included 3,600 feet of climbing on the bike and another 1,300 on the run. It started at 7,400 feet and peaked out at 9,400 feet. Onto the bike I was down 3.5 minutes back of the leaders Julie Dibens (3x World Xterra Champ back in her first race in nearly two years after battling injury) and Flora Duffy. 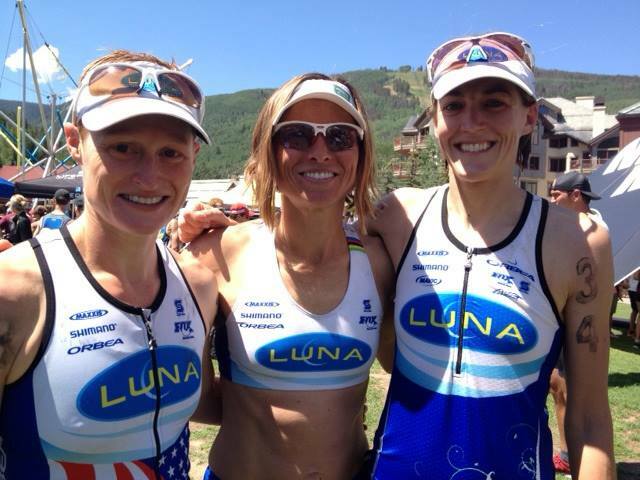 My teammate Suzie Snyder, as well as Kelley Cullen and Emma Garrard were also up ahead. As we headed up under the ski lift to begin the first 3.5 miles of climbing I could see Shonny back down the switchbacks. With her absence last year I knew she would be the biggest challenge of the day for me to attempt a repeat win from last year, especially as she lives in Durango during the summer. By that 3.5-4 mile mark I had passed Emma and then Kelley on the beginning of the pavement climb. By the end of the pavement I had passed Flora and could still see Shonny sneaking up on me. After a few miles of pavement we were back on the dirt and STILL climbing. And the top of all the climbing Shonny caught me and our teammate Suzie was in contact just ahead. After all the twisting descending and flats through some Aspen trees I had lost contact with Shonny but bridged up to Suzie on the next climb. We road together on the traverse across the mountain. After the most fun section of rolling descending single track it was one more short dirt road climb before the final corkscrew descent and into transition. 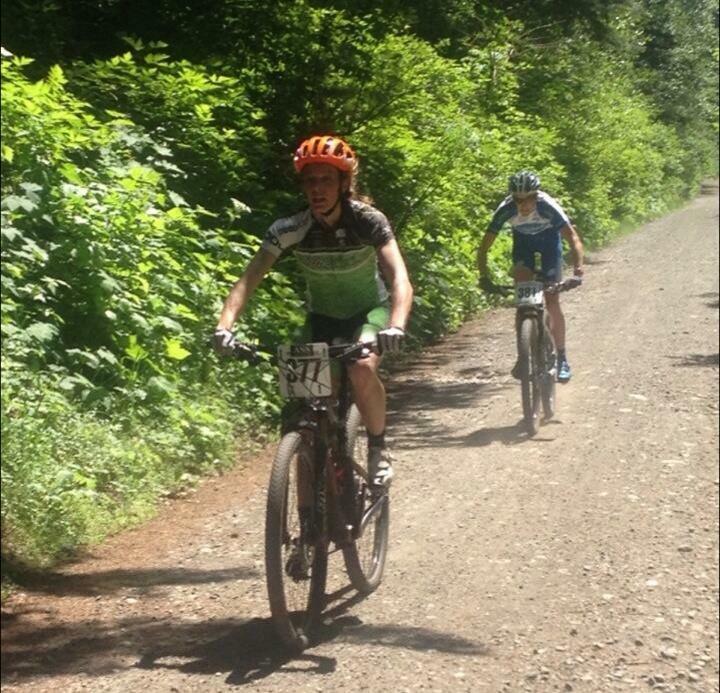 There I saw Julie Dibens and managed to put in a burst to get around her before the descent. Into and out of T2 it was Shonny, myself and then Suzie for a 1-2-3 for Luna. I did get one split that Shonny was about 2 minutes ahead. She is one of the stronger runners so I knew I would have to have a great run to catch her. So off I went feeling like I was in slow motion up and up through the Aspen trees with a few short reprieves along the way. I knew it was the same for everyone so just kept up one foot in front of the other! A long open road descent towards the transition area broke up the middle of the run. It was only a tease because right as you see the finish you have to head back up again for another loop of climbing before descending back to the finish. I was starting to feel a little queasy on the final climbs. I picked up a running partner, Craig Evans, for the last couple kilometres but unfortunately only managed to make up 25 seconds on Shonny by the end. A good day for sure and I hope I will be as fast as Shonny when I grow up to the age of 44 years young too! Suzie held on for 4th, while mom of two mountain star Kelly Cullen had a great race to run into 3rd. Rounding out the podium was mom #3 of the day, Emma Garrard. Thanks again to our Luna mechanic Chris, for the pre-race support spoilage. Thanks to Branden Rakita (also placing 2nd in the Pro Men) and his parents for the accommodation set up and the most amazing pre-race meal!! 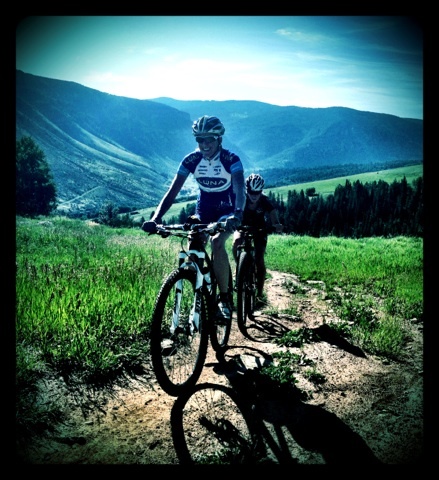 And thanks to Brandi and Craig for all the laughs and amazingly fun post-race day ride – recommended to us by men’s race champ and local, Josiah Middaugh. Beautiful views on day after race ride! Now I’m out on the Hornby aka Hippy Island for a bit before heading to a new Xterra venue, at Xterra Black Diamond in Seattle in a few weeks. Can’t wait to hang with the local Luna Chix team down there as well! It amazes me how we can push ourselves in a race, and then be hobbling around within minutes after finishing. This is what usually happens to me after these 2km swim/90km bike/21.1km run races, most commonly known as the half-ironman distance. For me, my second one in three weeks and last of the season (thank goodness! ), was a, as expected, tough day! After a post-race day of total uselessness and complete mental and physical depletion (thanks kids for enjoying two rainy day afternoon Monday movies with me and bringing me Kleenex when the tears flowed during Black Beauty!) I am feeling much more recharged today! For my second time at the Great White North triathlon, I got my wish from last year, a dry, mostly sunny day. However, the difference this year was a new course, with changes including a one-loop swim (although apparently it was as much 300m too short of 2km), a two loop (or rather out-and-back) bike, course, and a two loop (out-and-back mainly on the paved cycling paths) run. This year race start was at 7:30am so after less than 6 hours of sleep I was still feeling groggy before go time. I was also still in the port-a-potty line up when they called everyone out of the water at 7:10 saying the swim warm-up was over, doh! I guess I wouldn’t even get a warm-up to help me wake up! No matter, at least I still had time to get my wetsuit on and get down to the beach! And the positive was that the water was warm enough that is wasn’t too much of a shock to the system to dive in with hundreds of others and start swimming like crazy to keep a straight line and not get clobbered in the head too many times! On the 900m stretch to the first buoy things got pretty chaotic about half way there when everyone merged together where a little point of land stuck out into the water. The buoys were hard to see with the sun and I felt like I kept getting boxed in behind people. A not very smooth or straight swim to say the least! On the way into shore I also went too far right and was yelled left by the volunteers in kayaks. Finally out of the water, I was happy to be rolling on my bike but my legs weren’t feeling great. Annette got out just in front of me but slowly lost me and gained about 3min on me by T2. 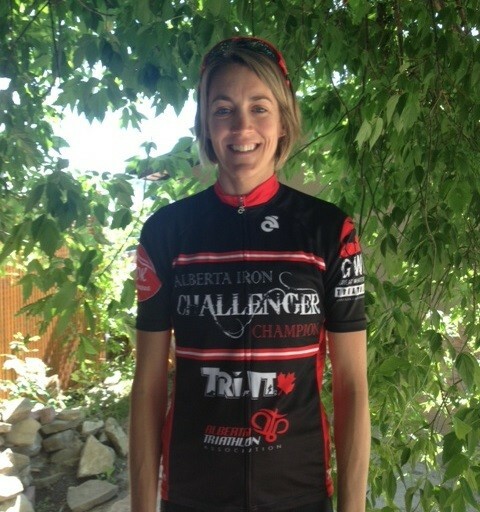 A newcomer to Alberta, and to triathlon in general, Karen Thibodeau (3rd in 2012 at Ironman Canada and this year’s Victoria Half-Ironman winner), already had at least a five minute lead with her mad swimming ability, and she only gained time on the bike. Meanwhile with lots of cross winds and rolling hill it felt hard to find a rhythm for me on the bike and to stay focused. One plus of mountain biking, there is no time to forget you are in a race with all the excitement the trail alone brings let alone the competition. So hands down to all the road triathletes out there who do so many of these races in the not so comfortable TT position staring at pavement for hours at a time. During temporary lapses of focus I was thinking of when I might sell my TT bike, ha, but focused on pressing on! Into T2 finally 2h36 minutes later. My amazing ball of energy friend, Suzanne, who though injured at the moment, made the trip with Coach Cal and I as moral support! As I struggled to get my run bag gear open, she let me know I was in 8th place and 13 minutes back. Ooooookay, must be a worse day than I thought. 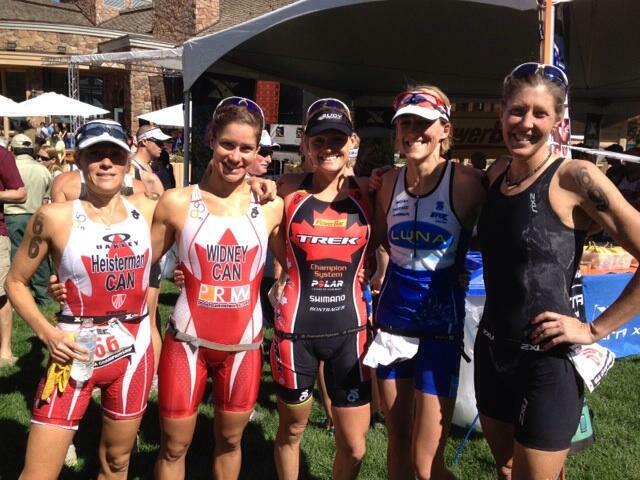 Turns out there were some relay team women in the mix and I actually was starting the run in 5th place. Some work to do regardless! Well, turns out my run legs seemed to be working fine. By the about the 13km mark I had moved into 2nd place (though I still was confused and thought I might be in at least 3rd until after I crossed the finish). I managed to cut 6 minutes off of Karen’s lead with a 1:24:29 run so I was happy I still had the energy/fitness to do that at the end of a long race. I also timed it well and crossed the line just as the sky opened up with a whopper of a thunderstorm downpour, nice! 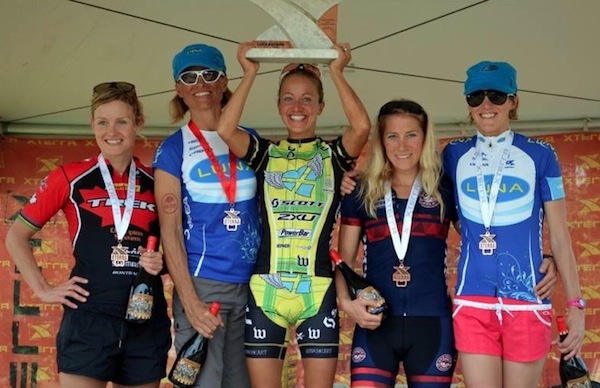 Congrats to Karen on the smashing win, and to the rest of the ladies on the podium: Lindsey Adams in 3rd, Kristina Schultz in 4th, and Sharon Styles in 5th. Congrats also to my amazing coach, Cal who finished 8th overall in the men (he is not slowing down one bit at age 45!!) as well as the 20 other CSR athletes who raced, many of who set PB’s for the distance! It is so much fun to know and cheer so many others on course, the fun of racing local! I was also excited to win to ATA Iron Challenger for some extra cash, and a great way to promote racing locally in Alberta! 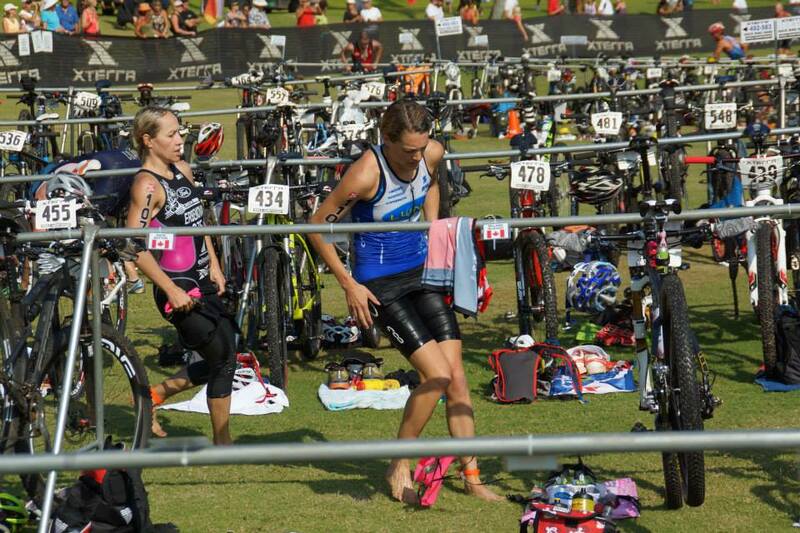 Over the past few years, I’ve done at least 1 or 2 half-ironman distance triathlons throughout my Xterra race season. The longer distance race is a great fitness and mental toughness test. 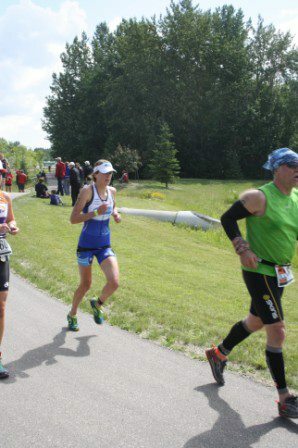 This weekend, the Chinook Half was probably my most enjoyable half-ironman triathlon race to date. The race takes place in the south of Calgary, so only a 20 minute plus drive from my door at 6:00am on a Saturday morning. At the 8:00am start it was cloudy, pretty chilly (8 degrees air temp and 16 degree water temp) but with my Orca Alpha wetsuit and Neoprene cap on, after a bit of a warm-up in Midnapore lake, it seemed tolerable enough for a 2km swim. Once we were off I found myself swimming with Emmanuela from Regina, and with her swimming just a bit quicker I decided to stay on her feet and conserve a little energy for a long morning at the office! 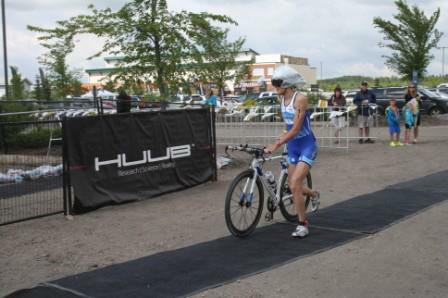 I was the 2nd women out of the water by 9 seconds (time 31:21), and found out after the race that there were cash primes for the swim, bike, and run. It would have been nice to have known this as I may have pinned it instead of staying steady into shore, oh well! Since my fingers were pretty numb, a big thanks to the great volunteer wetsuit strippers who got me out of my wetsuit and going again in no time! After one trainer ride on my TT bike on Wednesday to make sure it still works, I set on the bike with my new Giro TT helmet courtesy my Luna team. I love the built-in eyewear, and I also felt like Darth Vader on a mission as I could hear my breathing extra loud. The bike is longer than usual for a half by 6km, so a 96km ride. I put my vest on in transition afraid I would be cold, but the sun came out on the bike and it was just fine! The bike is very scenic and is an out and back on the rolling and scenic 22x highway with the Rocky Mountain back drop. I started to feel my unused TT riding muscles like my gluts and hips pretty quickly but tried to just relax and keep a good but strong cadence. About 15 min into riding I passed Emmanuela on one of the rolling hills and knew I was then the first female, okay just 85km or so to go and hold this position! On the way out the headwind was narly and the false flats and uphills made me feel like I was going nowhere fast. I just tried to stay in the aero position as much as I could, and not cook my legs too early. Leaving T1 equipped a little different than usual! At the turnaround, I could see Annette Kamenz was not far behind, a super strong rider from Edmonton. I had to get moving, and at least it felt like I was with a nice headwind on the way home (and a 20 minute faster ride on the way back thankfully and total time of 2:47). Soon Annette sling shotted by me on an uphill and I was determined to keep her in sight. When she had some shifting trouble on the next hill I got by again but not for long. Coming up on 20km to go I still had her in sight. However after that point it got tough as we were coming up on all the Olympic distance triathletes on the way back as well; their race had started 1h15 later than the half. I went as hard as I could to keep contact because I didn’t want to have to dig myself into a hole on the run, and couldn’t remember how strong of a runner Annette was! Coming into T2 my coach, Cal told me I was 1 minute down. Not bad, I thought. And Annette took longer in transition so when I came out running I saw her almost right away. I was surprised how good I felt running right from the start. As I came up on Annette I contemplated being more conservative to start and hanging with her pace for a bit, but realized I just needed to go my own pace. The sun was still out, the temperature was PERFECT, and I was looking forward to discovering the course on the first of the two loops for the run. After running on the bike path through the neighbourhood for a while we descended into beautiful park Fish Creek Provincial Park. I loved the fact we got to run a few kilometers on shaded dirt paths next to a creek. It was so pretty. There is one out and back point near the end of the first lap and there I calculated I had about a 2 minute lead, no time to take it easy for sure. The lap ends with a nice steep climb back up to the start/finish area. It was fun to see so many friends out watching and racing as I started out on the lonelier second lap. The first lap was full of racers finishing the Olympic distance triathlon. Thanks to Mike Bock, the race director, for putting on such a great event, with tons of awesome volunteers out there. 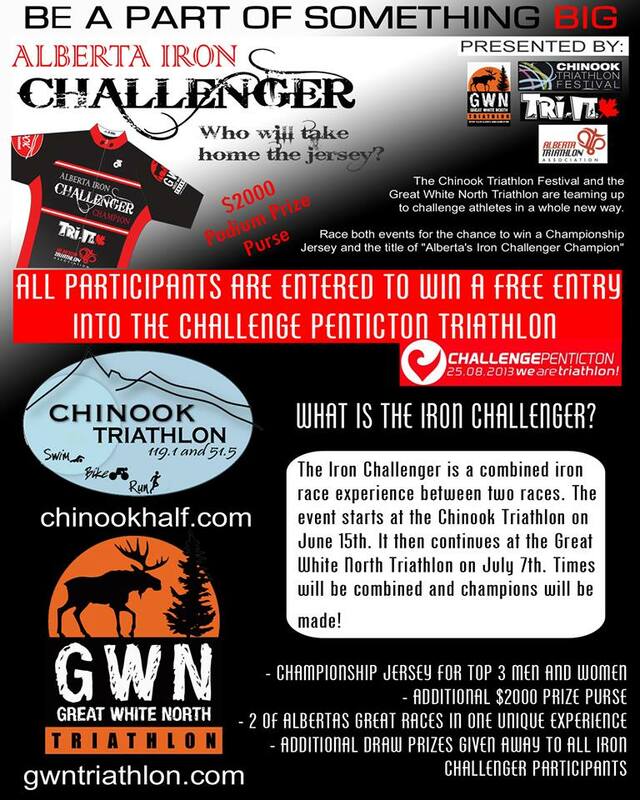 Thanks to Rose Serpico of Tri-It for encouraging me to enter this race just a few weeks ago and go for the Alberta Iron Challenger (see photo below). Of course, a little financial motivation doesn’t hurt. And thanks to Coach Cal for coming out to watch and giving splits! And of course, thanks to my wonderful team Luna for supporting me with the gear to jump in these crazy road events every so often! Up next (body permitting): Rundle’s Revenge in Canmore – time to hit the dirt for a weekend of mountain bike and trail running race-training! Tropical Storm, Raging River = Go With the Flow! If there is one thing I’ve learned after many years of racing and learning from the athletes I work with on mental preparation, it is that there are things you can control, and many you cannot when it comes to competition. If you focus on the “uncontrollables”, stay fixated on them and waste emotions on them, you will definitely be using up valuable energy needed to perform on race day! Be ready for anything and whatever will be will be! I like Will Gadd’s philosophy (a rock star rock climber from Canmore); he believes in the “positive power of negative thinking”. In other words, think of everything that could possibly go wrong and be ready for that! 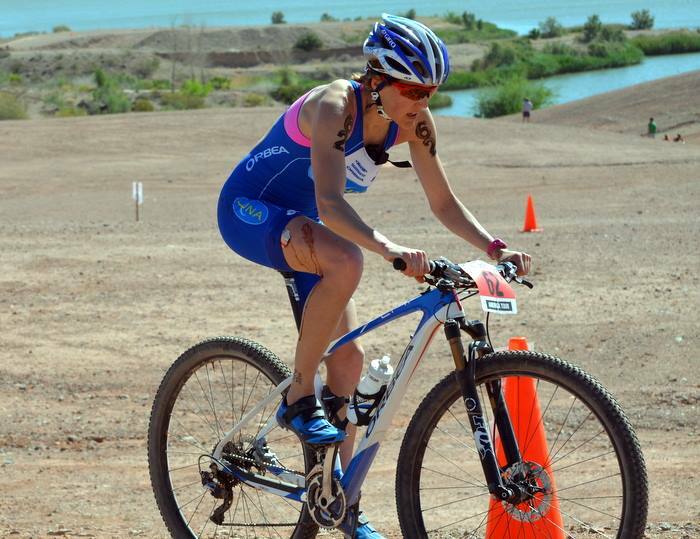 In my first year of racing Xterra, and at my first East Championship race in Richmond, VA eight years ago, while my bike arrived, my luggage got lost and never made it to me before the race. In the two days I had before the race I was madly running around to find rotors, run shoes, a helmet and other race gear, as well as trying to learn the tricky, twisty, “hard to remember what comes next” technical course and feeling pretty nervous about it and the open water swim in the river with a current. The night before the race I had no appetite, barely ate dinner, and went to bed with a horrible headache. Not surprisingly, the next day I felt super flat in the race and had nothing left in the tank, especially by the time I hit the run! On my first day back in Richmond this year on Friday the rain poured down like cats and dogs all day thanks to Tropical Storm Andrea from the south. Pre-riding was out as the course trails in the James River Park System were closed. Plan B ended being lots of chilling, going to the coffee shop, a short run, and a quick swim in an outdoor pool at the country club with the other Canadian girls in town (thanks to Mel for this rainy fun swim date!). On Saturday, the rain FINALLY let up before noon, and (gasp!) the sun started to come out! Brandi and Chantell had arrived and had not yet seen the course, so Katie and I took them on a ride of part of the drenched run course, and scouted out some of the mountain bike trails. There were draining incredibly fast so we were excited that at least the full mountain bike course should be open for the race if the rain held off and it got to dry out for the rest of the day and night. 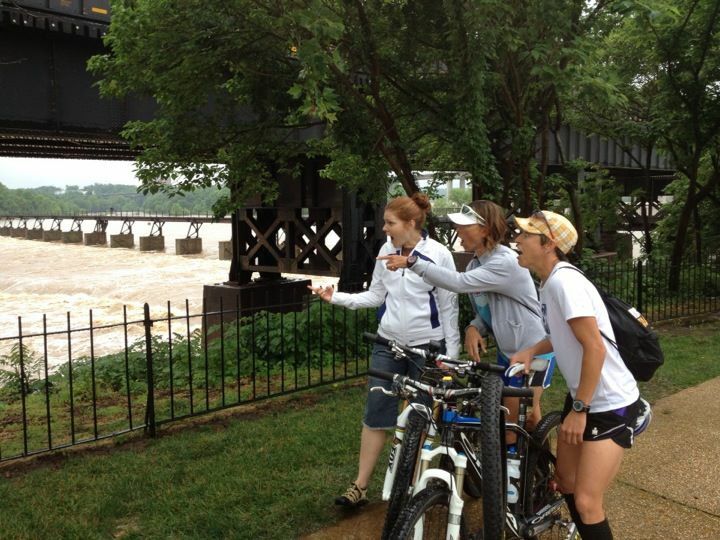 Meanwhile, the James River where we were to swim, had risen over 8 feet higher from the rain! It was ugly mud brown and flowing fast. Surely the swim would be cancelled and it officially was by Saturday evening (the only other time it had been cancelled in Richmond was back in 2003). 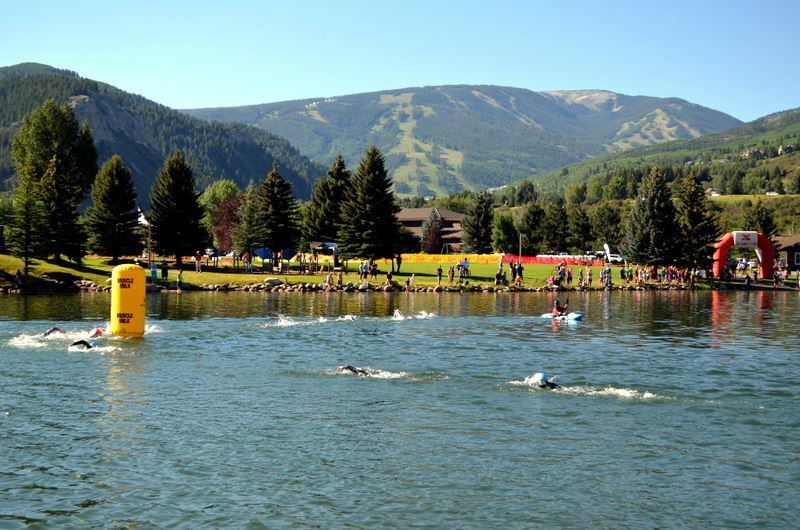 The swim course at this race is already shorter to begin with, and most of our times are roughly 6 minutes faster than the regular full distance swim. 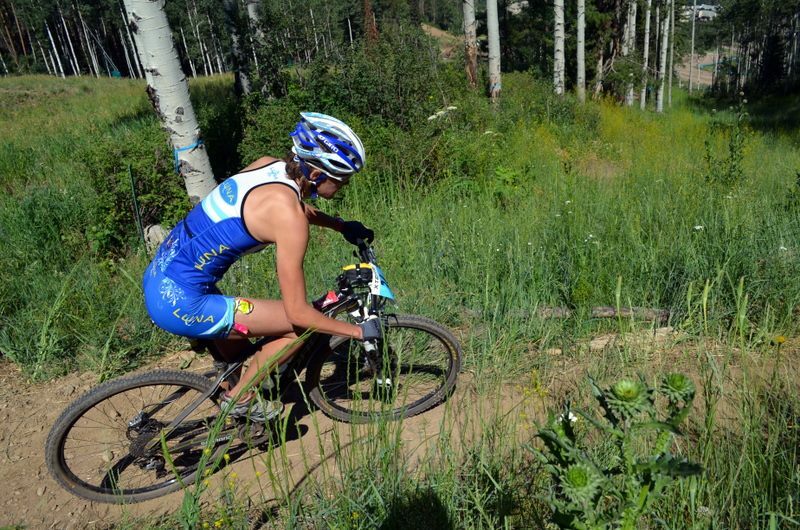 With the swim replaced by a 1.6 mile run, the long and technical mountain bike course favored the strong riders more than ever! I knew the run start would give me a small advantage but hardly any over the strongest riders so it wasn’t going to make it any easier! I was either indifferent to the decision or just in my learned Zen, go with the flow, What-ever mindset, ha! Our Pro race began at 8:00am. I ran in 2nd for the women, 30″ behind Leslie, and once out on the road over the river, Brandi and Mel had passed me before the first section of single track. I kept them in sight as long as I could but a few too many bobbles and unforced errors – to borrow from Tennis – yes I was in full control of my bike but many stupid mistakes over many obstacles added to precious seconds and contact lost over time. Soon Shonny was on me too. She rides as smooth as she talks with her Texan drawl and went by me and onwards to the front of the race with a lead over Leslie going into T2. Next to creep up on me was my other Luna teammate, Suzie, on the second lap of two. I kept her in sight all the way into transition and managed to bridge back up within a mile into the run. Then it was on and up the Mayan ruins, which makes the legs cramp big time and feel like crap for a few hundred metres. With about 1km to go, I was getting some cold shivers in the crazy humidity and I got another split that I was 25 seconds from 4th place. Unfortunately I was still 20 seconds too far by the finish and had to settle for 5th, but happy to be back on the podium! A big thanks to Chris cubed this weekend: our team mechanic Chris for the wonderful race support, Suzie’s bf Chris for the great help and feeds, and Shonny’s gf Kris for all the great laughs! Our mechanic Chris even jumped in the race, and rode the course blind and rocked it! Thanks also to our local Luna Chix Richmond team Audrey Kane for the homestay! It’s only uphill from here and I’m happy about it as far as Xterra goes! Psychological Dissection: Why can't I race as well as I train?